Please find attached the updated school bus advice sheet for Hillsbus services commencing 4 February 2019. 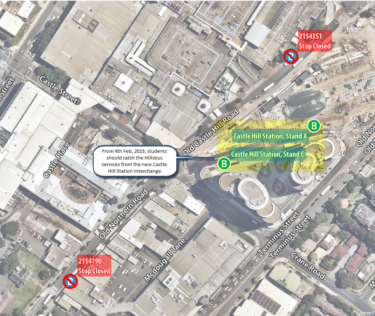 Please note the new Castle Hill Interchange will be open on Monday, 4 February 2019 and the current stops will be closed. All the Hillsbus public and school services will operate through the new Castle Hill Interchange from 4 February, 2019. Please refer to the below map for the locations of new bus stops.